Behavioral Neuroscientists study the behavior of animals and humans and the neurobiological and physiological processes that control it. Behavior is the ultimate function of the nervous system, and the study of it is very multidisciplinary. Disorders of behavior in humans touch millions of people's lives significantly, and it is of paramount importance to understand pathological conditions such as addictions, anxiety, depression, schizophrenia, autism among others, in order to be able to develop new treatment possibilities. 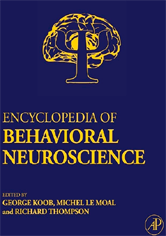 Encyclopedia of Behavioral Neuroscience comprehensively covers the foundation knowledge in the field.